The Belkin WeMo is a home automation product that works as a smartphone controlled power interrupter for standard electrical outlets. The screws are triangle (anti-tamper), 2.3mm. 2 of the four are hidden underneath the back sticker, which has to be cut before you can open it. Cutting the sticker to open the WiMo. There are two PCBs, with a 3-wire connector between them. One can bet that the three wires are logic power, ground, and relay on/off control. 1 contains all the power circuitry, one the low-voltage logic. The insides of the Belkin WiMo. They use a mechanical relay to switch the mains to the outlet. 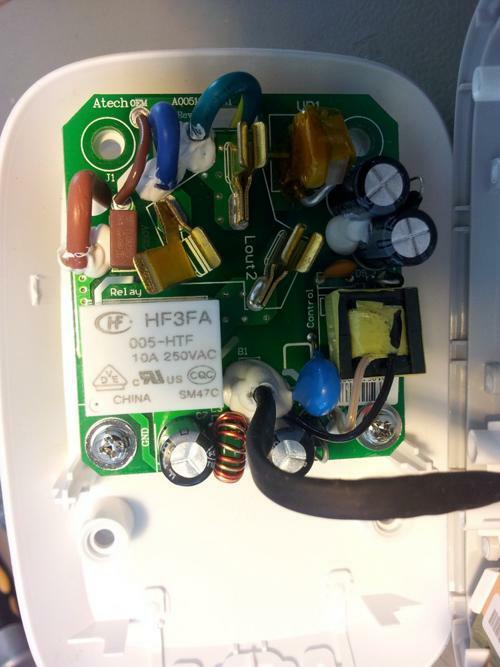 The relay is the HF3FA (005-HTF, SM47C), and is rated for 250VAC at 10A. As you would expect, it switches the live wire, ground and neutral are connected permanetly to the output. The power circuitry of the Belkin WeMo. The low-voltage rails for the logic board look to be generated by a transformer, diode (only a single one, not a bridge!) and capacitor arrangement from the 240VAC. The transformer has the number OEM-EPC130305001 GP on it. For protection, there looks to be a thermal PTC fuse (VR1), with something that looks like an LED taped to the side of it. This kind of looks like a post-PCB design hack, maybe they added the ability for the LED to go on if the PTC fuse triggers? There is also an inductory looking thingy (L3), which I think could be EMI filtering for the logic level power rail (it is right next to the connector). 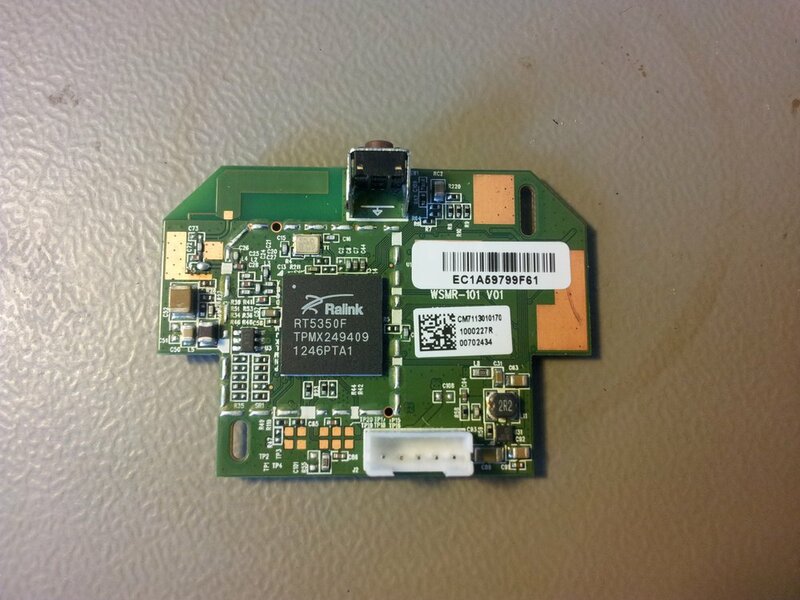 The main chip on this board is the Ralink RT5350F (other numbers on the IC are TPMX249409, 1246PTA1). This is a combined wireless front-end (1T1R 2.4G CMOS RF), stack (802.11n 1T1R MAC/BBP) and embedded CPU. I had a quick look on on AliExpress.com, and they seem to sell for about US$2.90, in quantities of 5 (Jan 2014). This is cheap (really cheap)! DigiKey nor any other non-Chinese supplier (try www.findchips.com) did not seem to stock these. The top-side of the Belkin WeMo's logic circuitry. Notice in the above picture that there is a PCB antenna in the upper-right corner of the PCB (when looking from the front of an assembled device, so upper-left in the image). On the other side of the board are two more ICs, the Winbond W9825G6JH-61 1302P 62267700003 (166MHz 256MB SDRAM TSOP 54-pin 0.80mm pitch IC), which was available on DigiKey for US$3.23 (1) and US$2.33 (1000). The other IC is a Macronix (MXIC) MX25L12835EMI-10G, which is 128Mbit, 104MHz SPI flash memory. This sells for US$3.35 (1) and US2.42 (1000) on DigiKey. 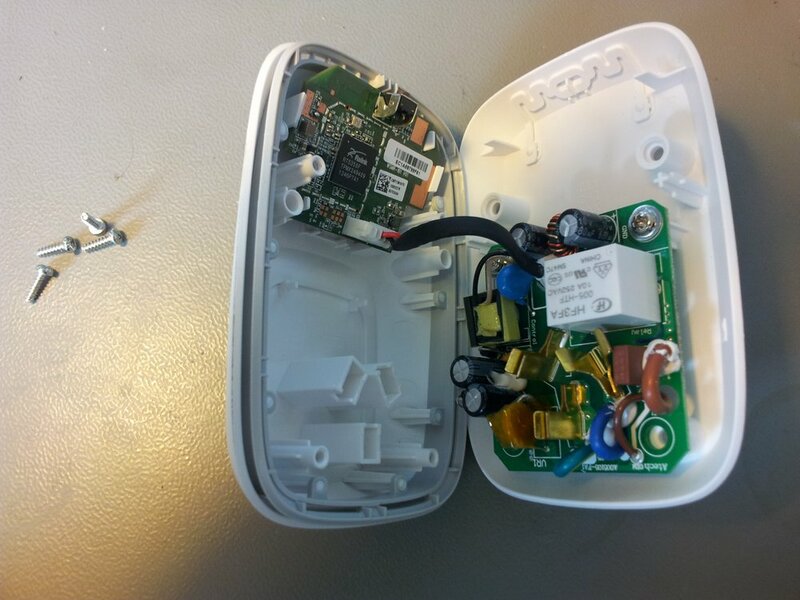 The bottom side of the Belkin WeMo's logic circuitry. 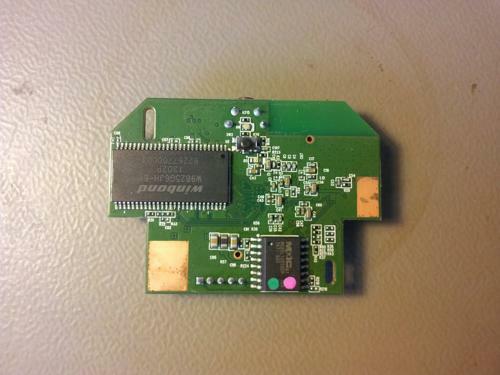 There is also a miniature switch on the reverse-side of the PCB (inaccessable to the user). 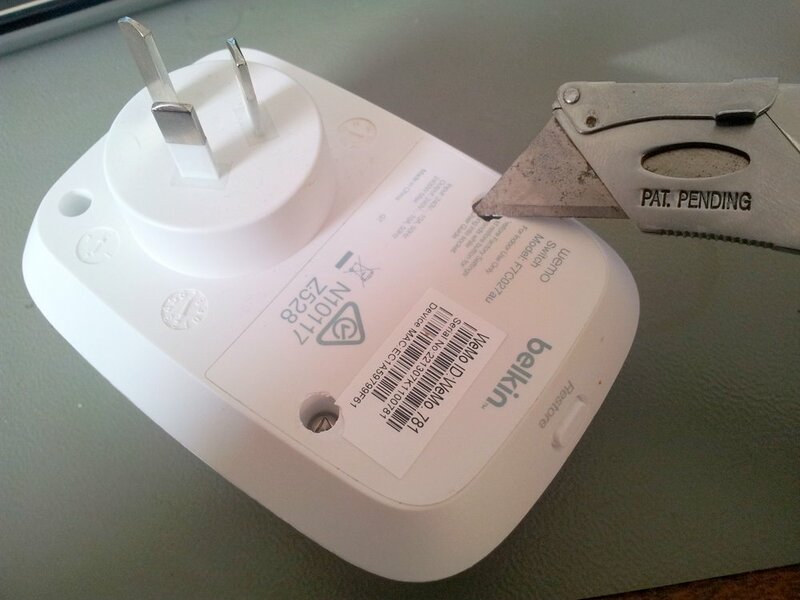 Another tear down for the Belkin WeMo exists at OpenWrt.